The Edmonton Valley Zoo joined the international initiative 'Year of the Frog' in 2008 to help keep frogs from going extinct. 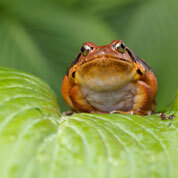 Work at the zoo continues and you are invited to support our commitment by adopting a Tomato Frog. Visit the Valley Zoo Development Society's website for more information about the adoption packages we offer and other ways to Make A Difference. You can now Adopt An Animal online or by contacting the Valley Zoo Development Society.